As the police are still searching for clues, Esme Barrera was laid to rest in her hometown of El Paso Tuesday, and this week there will be several benefit shows (both in Austin and in Brooklyn) to celebrate Esme’s life, and support the causes she participated in, and to help support her family and help with the memorial expenses. Tonight, Thursday, 1/12, starting at 7pm, the Scoot Inn will be hosting a show. Friday, starting at 5pm, Club 1808 will open its doors for another benefit show, and then Sunday starting at 3pm Frontier Bar, GSMG, and 3 Rules will be having another benefit. More details on these three Austin shows are below. 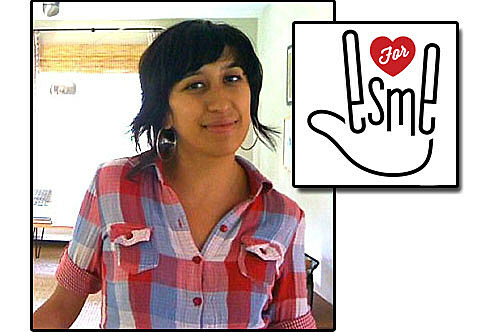 Also on Sunday a memorial service for Esme for friends and colleagues will be held in Austin at 2pm at Fiesta Gardens. Later this month, Ted Leo will be coming in for another benefit on January 28th at Beerland. Throughout the week, the loss of Esme Barrera was felt as clubs collected donations for her family. Some musicians also mentioned Barrera from the stage, including A Giant Dog, who dedicated John Wesley Coleman’s “Can’t Stop Dreaming” to Barrera, and Quin Galavis, who encouraged people to attend one of the benefits being held in Barrera’s honor in the coming weeks. “It’s been hard, but people are coming together and doing some great things,” Galavis said of the benefits. Please come and celebrate the life of a beautiful, vibrant person with music & friends- 2 things that were very important to Esme. Admission will be $5-$10, with 100% of the proceeds from the door going to Esme’s family. Doors open at 7PM. Obselete Industries will be doing on site screenprinting! Bring a t-shirt choose a print & donate 5 bucks to Esme’s family. Invite your friends – help spread the word! – You can make a Paypal donation to help Esme’s family here. 8pm in the backyard of 1808. This incudes 2 tickets to Pitchfork music fest, local restaurants, book and recod stores and lots more. Please visit the auction out back at some point during the night. Anyone is welcome to speak between bands as well. Join us to celebrate and pay tribute to her life with music as she would’ve wanted us to. GSMG, 3 Rules, and Frontier Bar will be presenting you with a night of great music in remembrance of our beloved Esme Barrera. 100% of the (door) proceeds will go to Esme’s family and to Girls Rock Camp, where Esme volunteered as a Music Mentor and Counselor. Below are the details for the benefit show. We encourage you to attend and help support Esme’s family through this tough time.